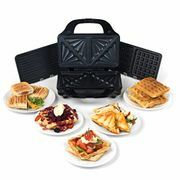 A panini maker can definitely help you make delicious breakfasts and snacks. Using the latest discount codes is an amazing way to get great value for your money. Our savvy money-saving experts will provide you with useful tips for you to save money. Purchase a panini maker from Amazon, eBay, Argos, and other UK retailers. Get big savings and you have the option to use the money that you have saved to buy more items. Our team of community bargain hunters has listed the latest panini deals and promotions you may want to check out. Find the best panini maker price from top brands! The first ever Panini grill was invented by Thomas Edison who everyone knows loved inventing things. He invented a sandwich grill made by two plates hinged together where it press the sandwich between them while warming the filling inside the sandwich. Making the sandwich a little crispy. Sandwich grill made it possible for two breads to be browned at the same time. Plate Material. This is one of the most important things you should take into consideration in buying panini press as it directly affects its performance. Cast iron and coated non-stick are the two basic materials of panini press. If you want to make a lot of sandwiches, choose a panini press made of cast iron as it is sturdier and more resistant to scratches, although it is heavier and expensive. Plates with non-stick coating, on the other hand, are all you need if you want something to make sandwiches occasionally although it wears easily. Floating Hinge. 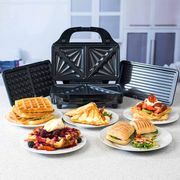 Allows you to move the press lid up and down to accommodate foods with different sizes thus having your panini press without floating hinges limits it to what it can hold inside. Heat Settings. Some models don’t have this function, but it can actually help you with your cooking as it has a quick settings of a toaster oven where you can convert your panini grill into other cooking modes. Ease of Cleaning. Models with non-stick coating are mothers favourite as it is very easy to clean and you don’t even have to scrub it unlike with cast iron plate. 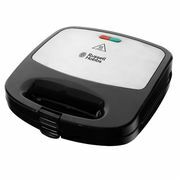 There are also panini press models which allow you to detach plates so you can clean it as you like. Drip trays are also common in any panini press as it will catch any runoff grease from the food you cook in a panini grill mode. Safety Features. Of course! Safety first above anything. One of the safety features you should look for in a panini press is insulated handles as it allow you to open and close the press without using oven mitts or towels. Hamilton Beach 25462Z Panini Press Gourmet Sandwich Maker. Wth features of reheat indicators and has impressive power, you can make sandwiches by two’s to three’s at the same time. Aside from its built made of premium quality materials, it also has floating lids and non-stick coating. 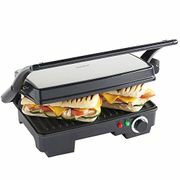 Cuisinart GR-1 Griddler Panini and Sandwich Press. Its upper and lower grill plates are both non-stick coated which makes it easy to clean. It has also features like a dual function of griddler and press, ready to cook indicator light and upon purchasing one, a cleaning tool will be given as a freebie. 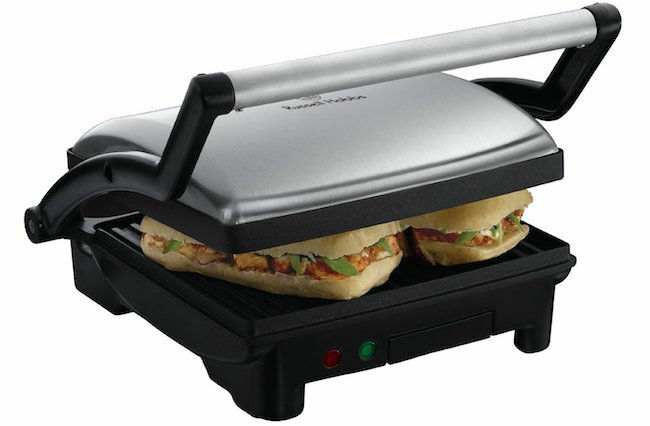 Oster Titanium-Infused DuraCeramic 2-in-1 Panini Maker and Grill. With a titanium-infused DuraCeramic non-stick coating, this panini press opens a full 180 degrees. Compared to other panini press, this one has a record of 30% faster cooking ability and has two plastic drip cups to collect excess oils. What makes this panini press special is it has hinge systems which make it easier to cook sandwiches with different thickness. Breville BGR820XL Smart Grill. Talk about a high-tech panini press? This one has features like IQ technology, digital display, drop of heat sensors, adjusting of temperatures and you can even open the grill plates to 180 degrees. Whether for indoor or outside use, this 1800 watts is very durable and sturdy. There are plenty of ways to save on your purchases online. Most online UK shops such as Amazon, eBay, Curry’s, and Argos among others have regular sales, seasonal clearance, and flash sales where you can get up to 50% off on a wide array of best sandwich press brands around. There are even retailers that have 3 for 2 and 2 for 1 offers on select items. Also, the best time to get huge savings is during Black Friday, Cyber Monday, and Boxing Day where an extensive selection of products like Breville sandwich press, Breville deep fill sandwich toaster, and Cookworks panini grill from your favourite UK retailers are reduced to clear. Knowing when and where to look for the lowest possible price on quality cheap panini grill and panini maker is the key here. Fortunately, you don't have to spend hours online searching for special offers, bargain deals, and price drops on panini sandwich maker Tesco or waffle and sandwich maker, and so much more. Our massive community of bargain hunters regularly share verified discounts, promos, and voucher codes from AO, Appliances Direct, Robert Dyas, and from other reputable shops across the country. We also have a team of money-saving experts who always share essential tips and tricks on how you can get every day low prices on small kitchen appliances when shopping both online and instore. Getting additional money off with the help of Latest Deals is easy. You can maximise your savings by simply using the latest panini discount code of your choice upon check out. There are also voucher codes that can provide you with free shipping and gifts.